In the case of the first dynamic (ecosystem services), operations and processes are increasingly viewed as a collection of services that come together with external services to create value. Designing this ecosystem must start from the edge – where business is conducted – and work backwards. Companies in the ecosystem must have the ability to seamlessly share information and outcomes, and the flexibility to change and customize offerings in response to external changes. The need for flexibility in operating and business models – as discussed in previous posts, business and operating model innovation is critical to future growth and differentiation. 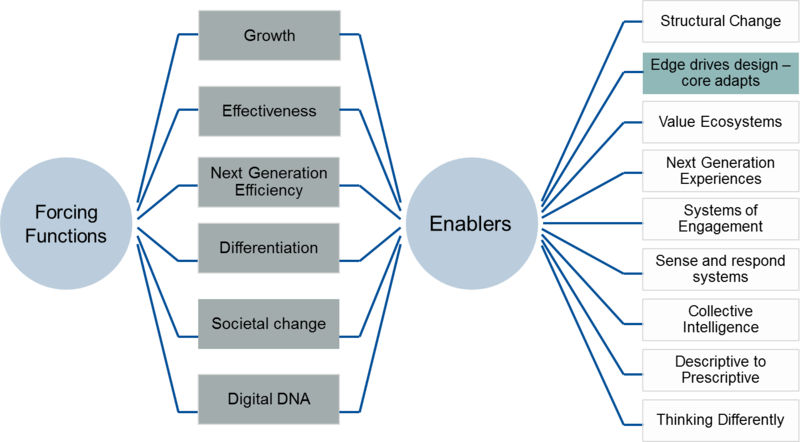 The environment must be adaptable enough to support changes to the models that drive competitive advantage and growth. Enabling the edge creates the flexibility to rapidly change models in response to external change. These drivers put a premium on innovation, creativity, and design both in terms of organizational culture and employee traits. With this as a backdrop, here are some of the tactics that should be part of programs that move the enterprise towards an edge-driven design paradigm. I’ll close this post with a description of the highest level of design maturity, as defined by a maturity model articulated in this Report from a design commission in Britain: You have reached the highest level of design maturity when design is used as a strategic core competency to influence the direction and ongoing evolution of the organization.